I will admit that mornings are not easy. There’s only one of me, and four kids who are all ravenous and somewhat unable to get their own food. If I can wake up and get dressed before they are out of their rooms, it’s a good day. But if they beat me to the kitchen, then I find myself going in circles pouring cereal and juice, cleaning up messes, and changing the baby’s diaper, all while I am still in my pj’s and trying to figure out what I am going to eat. A tired and hungry mommy does not make for a pleasant morning. I need easy breakfast recipes to get myself nourished. So, I have learned to strategize: if my food is already prepared, then I can heat it up while getting breakfast for the kids. I prepare their the night before too!) Then we can all eat at the same time, and I won’t be so cranky and short-tempered while packing their lunches and hustling them out the door! 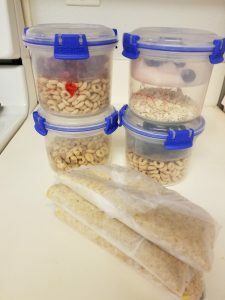 The trick to having quick, healthy breakfasts on the go is to make them ahead of time and store batches in the fridge or freezer that you can use throughout the week. I usually prepare mine at night when the kids are in bed. Just one or two nights of prep per week, and then I wake up each morning knowing that I have a healthy breakfast waiting for me. Are you not really a breakfast person? I hope you will become one after reading this! There is something here for everyone: sweet or savory, cold or hot meals–all of them with healthy doses of protein and fruit, and a low amount of fat! Combine oats, milk, yogurt, vanilla, pudding mix, and cinnamon to a mason jar or other sealable container. Stir contents until well mixed. Cover and refrigerate 4 hours or overnight. This makes 1 generous serving. I usually double it to have enough for 2-3 days. 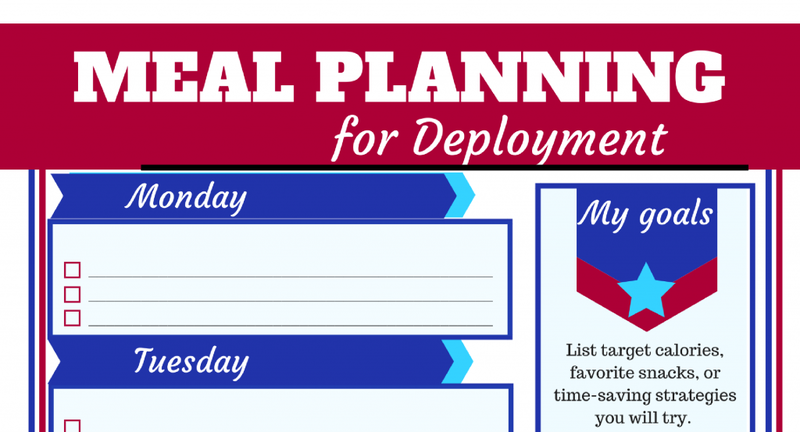 You can get a meal planning guide to help you through deployment, or other times in military life when you are a solo parent. It’s part of my larger Deployment Guide, which is part of the Deployment Masterclass. In a large bowl, whisk together eggs milk, salt, garlic powder, and pepper. Set aside. Add 1 tablespoon of the olive oil to a large nonstick skillet over medium and heat until it shimmers. Add the spinach and cook stirring often, until it begins to wilt, about 1 minute. Add the beans, then carefully pour in the eggs and cook, stirring occasionally, just until set, about 3 minutes. Taste and season with additional salt or pepper as desired. Remove from the heat. To make the quesadillas: Sprinkle a tortilla with 1/8 of the shredded cheese, leaving a small border all the way around the edge. Spoon 1/8 of the egg mixture on top, then fold in half. Repeat with remaining tortillas. To cook, carefully wipe out the skillet, lightly coat with olive oil, then heat over medium. Cook the assembled quesadillas on both sides until golden and the cheese is melted, about 5-6 minutes total. Cut into triangles and serve warm. Add dry ingredients to wet ingredients and stir. Stir in milk until all ingredients are combined – don’t over mix, there should still be a few lumps. Grease griddle and pour ¼ – ⅓ cup batter onto the griddle. Allow to cook for about 2 minutes or until edges begin to look “dry” and bubbles form in the batter. Use a thin spatula to flip the pancake over and allow to cook for a mother minute. Transfer to a platter and continue with remaining batter. Place all ingredients in a crock-pot. Turn to high and cook for 4 hours or turn to low and cook for 8 hours. Once your oatmeal is done cooking, stir with a wooden spoon for 2-3 minutes or until it becomes thick and well-combined. Place the oats in the blender, and pulse until they have turned into a powder. Add the other dry ingredients to the blender and pulse to mix. Combine all wet ingredients except the blueberries in a bowl, then add the dry mixture from the blender. Pour into well-greased muffin tins. Press berries into the muffin batter, spreading the blueberries evenly between all muffins. Bake at 350 degrees for approximately 20 minutes. Makes 12 muffins. For each roll, take 1 marshmallow (which represents Jesus in His purity and innocence from sin) and roll it in melted butter, then cinnamon. These represent the embalming oil and spices used for the burial. Then wrap the spiced marshmallow in a triangle of crescent roll dough, making sure to seal all the edges. This represents the tomb, with the stone sealing the entrance. Once they were all wrapped, the kids said goodbye, just as Jesus’s friends said farewell to Him, and we put them in the oven: 350 degrees for 10 minutes. While they baked, we read the second part of the Easter story: the account of Sunday morning. I told the children this was the part with the surprise. Jesus was not in the tomb because He had risen from the dead! When the rolls came out of the oven, they were golden, and still had the same shape of the tomb. But the marshmallows had melted into sugar, so when the rolls are cracked open, they reveal… an empty tomb! Jesus has risen! 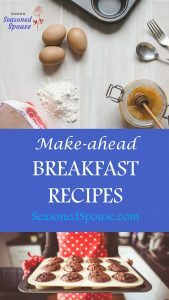 Do you already make your breakfast ahead of time? I would love to hear your ideas. If not, I hope you will try these out. Let me know which is your favorite!